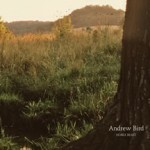 So, I picked up a copy of Andrew Bird's new album Noble Beast today. Yes, I know that today is January 18th and it's not released until January 20th. That's why this post isn't going to be published for two days. The instrumental beginning of Effigy. And the double-stopping soloing in the middle. Really, the whole song. Yeah, I know, this isn't much of a review. Well, I'm not much of a reviewer. So I'll give you my bottom line -- go buy the album now.